AT&T Communications, LLC is a division of AT&T that focuses on wireline, wireless, digital television, satellite television, fixed line telephone, mobile phone, broadband, home security, IPTV, OTT services, network security, and pay television offerings, as well as business solutions. This is the corporate division that was created in 2017 to house all of AT&T's Telecommunications and Technology Businesses, which include AT&T Mobility, DirecTV, U-Verse, AT&T Business, AT&T Intellectual Property, AT&T Labs, Cricket Wireless, AT&T Digital Life, Vyatta, AT&T Business Solutions, AT&T Consumer Mobility, AT&T Entertainment Group, AT&T Technology & Operations Group, and Technology and Operations Group. As of June 2018, it is AT&T's largest division by revenue. The long distance division of AT&T Corp.
On July 28, 2017, AT&T announced a new AT&T Communications corporate division housing AT&T Mobility, DIRECTV, U-Verse, AT&T Business, AT&T Intellectual Property, AT&T Labs, Cricket Wireless, AT&T Digital Life, Vyatta, AT&T Adworks, and Technology and Operations Group. By the end of July, the company announced that, effective August 1, a new structure was created before the acquisition would close. This structure has John Donovan take the title of CEO of the new AT&T Communications, LLC subsidiary division (incorporated that same day after a dividend payout). AT&T named John Stankey to run Time Warner media businesses and John Donovan as CEO of AT&T Communications ahead of the Time Warner acquisition. In November 2017, the U.S. Justice Department said it was moving to sue to block the AT&T-Time Warner merger. On November 20, 2017, the Department of Justice filed an antitrust lawsuit over the acquisition; Makan Delrahim stated that the deal would "greatly harm American consumers". AT&T asserts that this suit is a "radical and inexplicable departure from decades of antitrust precedent". On December 22, 2017, the merger agreement deadline was extended to June 21, 2018. On June 12, 2018, the AT&T-Time Warner merger was approved by a federal judge. Two days later, AT&T completed the acquisition of Time Warner, and a day later the company was renamed WarnerMedia. On July 10, 2018, AT&T announced that it would acquire cybersecurity startup AlienVault for an undisclosed amount. The acquisition was completed on August 22, 2018. 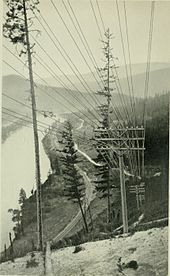 The American Telephone & Telegraph Long Lines wire, cable, and microwave radio relay network provided long-distance services to AT&T and its customers. The connection to other countries from the United States began here. By the 1970s, 95% of distance and 70% of intercity telephone calls in the United States were carried by AT&T. Before utilizing microwave relay and coaxial cables, AT&T used lines for long distance service. In 1911, the system connected New York to Denver. The introduction of repeater towers allowed such connections to reach across North America. In the 1930s the company experimented with long-distance coaxial cable. The first long-distance L-carrier coaxial link in 1936 connected Philadelphia and New York City. With improved klystrons and other devices devised for World War II, it was quickly determined that relay networks were easy to build, especially over mountainous regions and rough terrain. Coaxial systems connected all major US cities, but the primary links used microwaves. Formal opening of the United States coast-to-coast connection was on August 17, 1951, via AT&T's network control center in New York City. A presidential address from Harry Truman at the San Francisco Peace Conference on September 4, 1951 opened the network, demonstrating coast-to-coast television service. The first regularly scheduled show to use this was Edward R. Murrow's See It Now on November 18, 1951. Later the network allowed events such as American Bandstand and ABC's Monday Night Football to be broadcast live nationally and permitted distribution of regional sports events, such as Saturday football games prior to the adoption of satellite communications in the 1970s. By the 1980s, alternatives supplemented what was in place. Long Lines briefly published a periodical, TWX, targeted to companies that used AT&T's equipment and services, particularly TeletypeWriter eXchange, from which it took its name. The periodical was discontinued in 1952. In 1950, New York City's five boroughs were dialed from various communities in New Jersey with the digits '1-1' followed by the 7 digit telephone number. While New York City was assigned area code 212 at the very beginning of the Area Code format in October 1947, it wouldn't be until later in the 1950s when Englewood, New Jersey, customers would dial their calls to New York City using the digits 2-1-2. The use of the '11+' code from Englewood (and other parts of northeastern New Jersey) to call New York City had been in place for a while, even prior to 1951. New York City's five boroughs also had been dialing northeastern New Jersey as 11+ the two letters and five digits of the New Jersey number as well for a while prior to 1951 and until the latter 1950s. The use of area code 201 to call New Jersey from New York City didn't begin until the latter 1950s. Other cities in northeastern New Jersey were dialable in 1951 (and for a few years prior) from Englewood by simply dialing the two letters of the exchange name and remaining five digits. In addition to New York City, the Nassau County part of Long Island was dialable from Englewood and Teaneck using area code 516. Also Westchester County, Rockland County, and portions of Orange and Putnam Counties were also dialable from Englewood and Teaneck in 1951 using area code 914. Early in the 20th century, the telephone companies organized a "Separations and Settlements" process by which Long Lines and the local companies divided the revenues of long distance calls according to their respective costs. The mid-century advent of microwave and other high capacity systems dramatically cut the cost of long-haul operations, but pricing did not decline proportionally. Rather, the local fraction of revenue-sharing rose to subsidize local service. AT&T Communications became one of the three core sales units of AT&T after reorganization of assets. AT&T Communications of Indiana, G.P. AT&T Communications of New York, Inc.
AT&T Communications of Delaware, Inc.
AT&T Communications of Michigan, Inc.
AT&T Communications of Ohio, Inc.
AT&T Communications of West Virginia, Inc.
AT&T Communications of Wisconsin, L.P. Following the Telecommunications Act of 1996, AT&T Communications began reselling Bell Operating Company-provided telephone service at lower prices to compete with the Baby Bells. Their names were: Ameritech, Bell Atlantic, BellSouth, NYNEX, Pacific Telesis, Southwestern Bell, and US West. The advertising campaign which had a broad appeal was named AT&T CallVantage. In 2005, SBC Communications purchased AT&T Corp., the parent company of AT&T Communications. SBC had already been offering its own long distance services through SBC Long Distance LLC in its own territory in competition with other long distance companies. As a result, AT&T Communications was refocused to seek new customers outside of the AT&T 13-state region served by its Bell Operating Companies. In 2010, AT&T Communications (and subsidiary AT&T Communications of New England) was merged into AT&T Corp. In 2012, 17 more of the AT&T Communications companies were dissolved into AT&T Corp., leaving only the companies in Indiana, New York, Virginia, and Washington, D.C. as the last remnants of the 1984-created structure. On July 28, 2017, AT&T announced a new AT&T Communications corporate division, which will house AT&T Mobility, DirecTV, U-verse, AT&T Business, and Technology and Operations Group. ^ Spangler, Todd (2017-07-28). "AT&T Confirms John Stankey Will Oversee Time Warner Post-Merger". Variety. Retrieved 2018-08-28. ^ "AT&T Makes Executive Appointments to Prepare for Time Warner Merger Close". about.att.com. Retrieved 2017-08-04. ^ Stelter, Brian (2017-07-28). "AT&T names John Stankey to run Time Warner media businesses". CNNMoney. Retrieved 2017-08-04. ^ "John Donovan officially named CEO of AT&T Communications ahead of Time Warner acquisition | FierceWireless". www.fiercewireless.com. Retrieved 2017-08-08. ^ "AT&T to buy cybersecurity firm AlienVault". Reuters. Retrieved 2018-07-10. ^ "AT&T Completes Acquisition of AlienVault". AlienVault Press Release. August 22, 2018. ^ "AT&T Labs Fosters Innovative Technology – AT&T Labs". ^ "Address in San Francisco at the Opening of the Conference on the Japanese Peace Treaty. September 4, 1951". The American Presidency Project. Retrieved 28 May 2012. ^ Huurdeman, Anton A. (2003). The Worldwide History of Telecommunications. John Wiley & Sons. p. 302. ISBN 978-0-471-20505-0.